A Pygora is a fiber goat purposely bred to produce fine fiber for hand spinning. The Pygora goat produces a wonderful, lofty, soft, fiber that does not coarsen as the goat ages. Add in an affectionate, engaging personality, a manageable size, good health and fleece in a range of colors and you have the perfect fiber goat. Pygora kids weigh about 5 lb. at birth. Adult does (female Pygoras) average 80-120 lb. and must be at least 18 in. tall. Adult bucks (male Pygoras) and wethers (neutered males) average 75-140 lb. and must be at least 23 in. tall. in long lustrous ringlets. 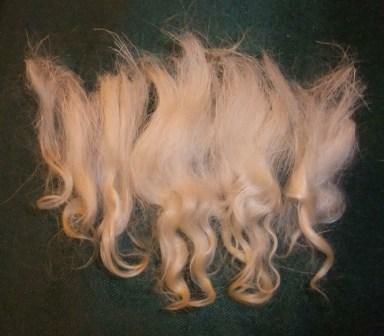 It may be a single coat, but a silky guard hair is usually present. The fiber is very fine, usually less than 28 microns. The handle should be silky, smooth and cool to the touch. Type-A goats usually are shorn twice a year​. Type B fiber is curly and average 3-6 in. in length. There is an obvious guard hair. A second silky guard hair is also usually present. . It is lustrous fiber and the handle is soft and airy. The fiber averages less than, 24 microns. The fleece color is usually lighter than the guard hair color. Type-B goats usually are shorn twice a year. Type C is a very fine, cashmere-like fiber, usually below 18.5microns. It averages 1-3 in. long. It has a matte finish and a warm, creamy handle. It must show crimp. There is good separation between a very obvious coarse guard hair and the fleece. 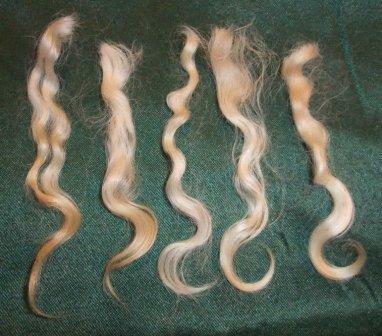 The fleece color is usually lighter than the guard hair color. 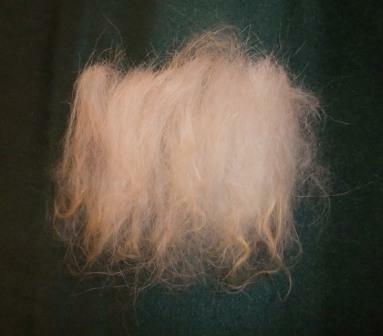 A type-C coat can be harvested by brushing, plucking or shearing. The yield is quite small, but the effort is worth it. Type-C fleece is unbelievably soft. Pygoras tend to be very healthy goats as long as they receive proper care. They breed and kid easily, and are naturally good mothers. Pygoras were developed by Katharine Jorgensen in Oregon. The Pygora Breeders Association (PBA) was formed in 1987 and maintains the registry herd book. The only goat that may bear the name ‘Pygora’ is a goat registered with the PBA. In addition, all Pygora goats must conform to the Pygora Breed Standard, which includes conformation, color/patterns and fleece characteristics.